Make the transition to warmer weather with 11 salads featuring fresh fennel bulbs and the plant's herbaceous fronds. This delicious, 30-minute orzo salad is made with capers, almonds and olives. Jalapeño chiles add smoky flavor to this excellent salad. What's the secret to this healthy salad? Soaking the sliced fennel in icy lemon water before serving makes the pieces extra-crispy. This fast whole grain salad is also great with wheat berries, spelt or barley. This easy salad requires just four ingredients, plus salt and pepper. 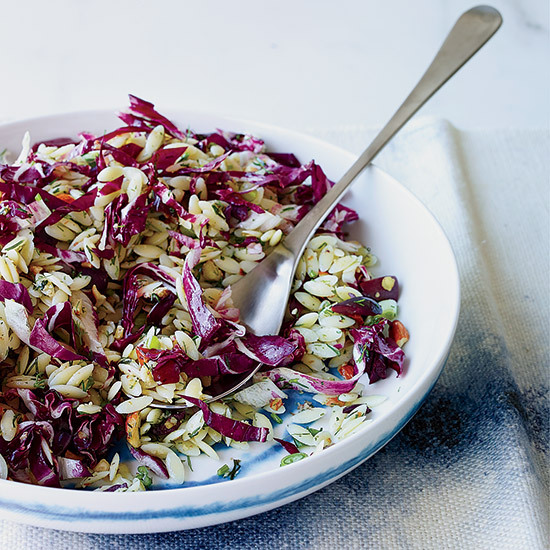 Star chef Stephanie Izard's salad features thin slices of raw kohlrabi, which tastes similar to broccoli stem but is milder and sweeter. Fennel, scallions, parsley and salt aged pecorino cheese star in this fast, vegetarian salad. Serve this healthy side salad with cumin-fennel rubbed salmon. This incredible citrusy salad is spiked with grated ginger. Instead of haricots verts, chef Eberhard Müller uses regular green beans for this quick salad. This terrific salad is ready in just 15 minutes.